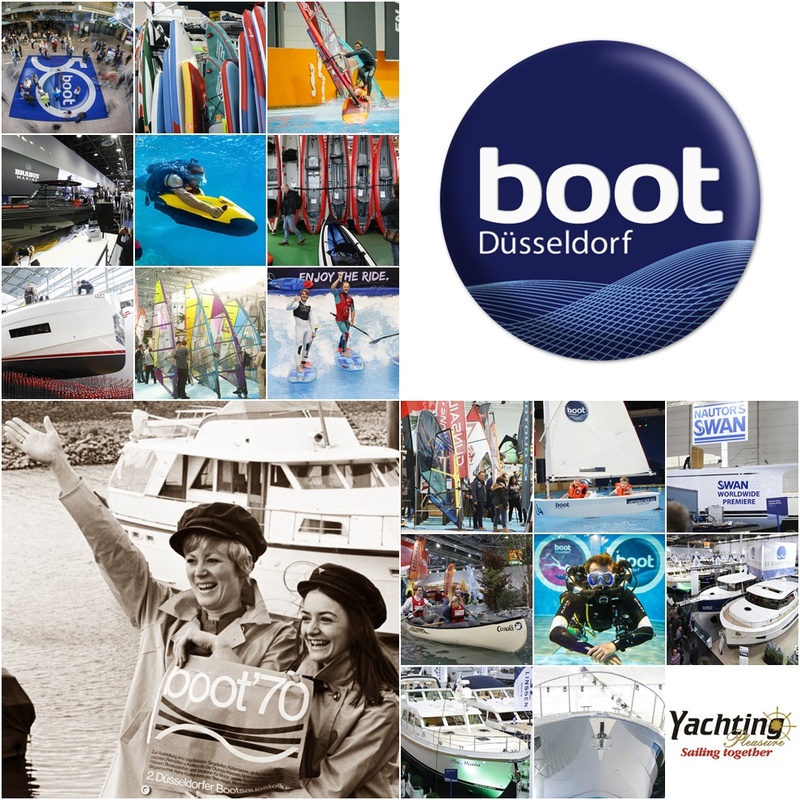 Well positioned at the beginning of the calendar year, the boot in Düsseldorf is a perfect opportunity to launch the latest novelties managing to keep alive the public interest every year. Although the press usually focuses more on large yachts, where public access can only be done in a planned manner, the organizers take care to support and develop all the nautical sports, providing generous spaces for nautical themes. Thus, in small pools there can be tested kayaks, surfboards, windsurf and diving equipment. There are also creative workshops for those who want to discover the abc of sailing knots or for those who want to see how a wooden boat is built. 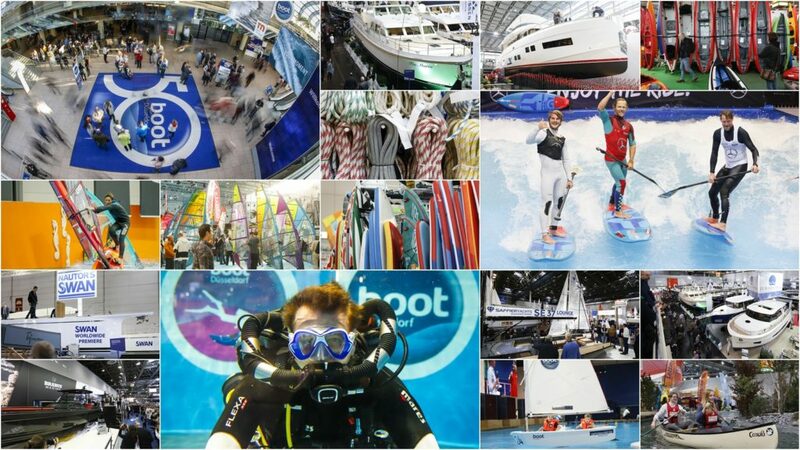 Children visiting the exhibition at younger ages are thrilled to discover the nautical sports in this way ensuring a healthy development of the entire sector. This all together clearly contributes to educating the public, an aspect that I consider to be more important than all the novelties presented there. If above I mention about the benefit of good positioning of the event at the beginning of the year I should perhaps also mention the logistical advantage that the exhibition offers due to its location on the Rhine, which ensures the transport of large vessels directly on water up to several hundred meters from exhibition halls. In fact, for the arrangement of the stands where these yachts are located the logistics is impressive and some constructions seem to be made to last for years not just for two weekends. In the 16 exhibition halls you could found virtually everything you wanted from artworks, clothing, sailing schools to megayachts. But one day ticket of 25 Euros it will not be enough to cover the entire exhibition, so for those who are interested in visiting the boot, I recommend a “stay” of at least two days. In the five days, as long as I stayed at the exhibition, I met many Romanian visitors and also an exhibitor (Constantin Nautics) who was trying to promote their nautical bracelets on the German market. Because of the busy schedule, the large number of boats launched this year and numerous invitations to events received from the yacht manufacturers this was probably the first year when I didn’t really manage to thoroughly cover the entire exhibition. From a commercial point of view, there is some tension in the production area regarding the import and export of boats from US and UK whose costs could rise. In this matter companies that have not prepared in time to cope with these tax changes are looking for solutions and either they transfer some of their production lines across the ocean or make different associations with other companies sharing infrastructure to keep their products at competitive prices. Industry giants such as Azimut-Benetti, Ferretti Group, Beneteau Group, Brunswick or Hanse Group are prepared for this change. For Sunseeker and Princess Yachts things may be more complicated. As I mentioned previously, the list of novelties is quite long and some of them have already been featured on our websites and others will follow in the near future. From the sailing category we can mention: Arcona 435, Fountaine Pajot Astréa 42, Beneteau Oceanis 30.1, Dufour 390 Grand Large, Cantiere del Pardo Grand Soleil 48 Performance, Hallberg-Rassy 340 and 57, Hanse 458 and 508, Jeanneau Sun Odyssey 410, Lagoon 46, Nautor`s Swan 65, Oceanis 46.1, Privilège Signature 510, Solaris 44, Southerly 435, Sunbeam 46.1, Wauquiez Pilot Saloon 42 and X- Yachts X4⁶. From the motoryachts category the list is even longer: Absolute 62 Fly, Absolute Navetta 48, Axopar Shadow ‘One of Twenty Eight’, Azimut Atlantis 51, Azimut S6, Bayliner VR4 Bowrider, Bénéteau Flyer 8 SUNdeck, Bénéteau Swift Trawler 47, Bluegame 42, Boarncruiser Elegance 1280 Sedan, Boston Whaler 170 Montauk, Buster Phantom Cabin, Cranchi Crossover T 36, Fairline Squadron 64, Ferretti 670, Fjord 52 Open , Fountaine Pajot MY 40, Frauscher 1017 GT Air, Galeon 640 Fly, Glastron GTD 220, Greenline 48 Coupé, Invictus 320 GT , Jeanneau Merry Fisher 1095, Marex 360 CC, Nerea NY24, Pershing 8X, Princess Y85, Privilège Euphorie 5, Quicksilver 675 Pilothouse Explorer, Riva 66′ Ribelle, Sanlorenzo SX88, Sealine C390, Silver Fox BR, Sunseeker 74 Sport Yacht, Targa 27.2. Apart from the above list, I should add other novelties from the kayaks, SUP, kitesurfs, inflatable boats, equipment and accessories categories but I would probably fill up two pages only with brand names. And if all of these doesn’t constitute enough arguments to visit the exhibition I can tell you that this year at the event were present about 2000 companies from 73 countries and there were about 250,000 visitors. In another train of thoughts, unrelated to the nautical field, think about the economic effects, even for a big city like Düsseldorf who is “forced” to offer accommodation, meals, etc. for such a large number of water sports enthusiasts. Next year, the exhibition will take place between January 18-26, 2020.